Interior design trends may come and go, but one type of décor that never seems to go out of style is rustic farmhouse. Even if you don’t want to design your entire home in this style, rustic furniture complements just about every other style of design. So, regardless of how your home is decorated, a piece of rustic wooden furniture will add a natural element and a touch of warmth and comfort that many other styles might lack. If you’re thinking of redesigning your home’s interior, then here are five reasons why you can never go wrong when choosing the rustic look for any of the rooms in your home. Rustic furniture is made from genuine wood, so it has a natural ability to keep you grounded, in both your body and your soul. The material comes directly from the earth, so there’s a life to it that you just can’t get from man-made materials. Every piece is unique, and simply running your hand over the surface of the wood will bring a sense of peace and serenity. Furniture that’s crafted from man-made materials tends to weaken and break very quickly because it is often not designed to last. But when you purchase wood furniture, you can expect it to last for decades, making it an excellent investment. Wood is extremely durable and capable of withstanding nearly everything you can throw at it. It’s also the only material that improves the older it gets. Based on the beauty of nature, rustic design features plenty of warm colors and textures. This is most evident in its furniture, which showcases the incredible range of brown, red, and yellow hues found inside of the different species of trees. Rustic design is also simple to achieve, which makes it very approachable for someone who never went to interior design school. It’s not difficult to make your home cozy and inviting when you incorporate farmhouse designs and color palettes. Kids can be very hard on furniture – anyone who has a family knows this to be the case. But that is something you won’t have to worry about when you have wooden furniture because there are already nicks, dents, and scratches present in the wood. This makes the furniture very family friendly. In fact, any damage your child does to the furniture will usually only add to its natural appearance, if it can’t be easily removed. Log Furniture Place is where you can find genuine hand-made rustic furniture for every room in the home. Every piece we make is carefully hand-honed and treated with the utmost respect throughout the production process. If you want to make your home more rustic in its design style, then shop our online furniture inventory today. You’ll love the selection and prices for our natural wood products and farmhouse accessories. We work tirelessly to ensure your complete satisfaction, and we back up every piece we make with a solid warranty. Contact us today if you have any questions regarding our process and/or customization options. This entry was posted in Rustic Beds, Rustic Furniture, Rustic Decor, Rustic Outdoor Furniture on January 7, 2019 by Log Furniture. Pine and cedar are among two of the most popular choices when it comes to rustic furniture. But while both are considered to be “soft woods,” they each have their own unique properties and characteristics. When selecting bedroom furniture, this detail could impact your choice when deciding on the right kind of wood you want your rustic furniture to be made from. Here’s a breakdown of what each of these woods brings to the table, so you can have a better idea of what kind of wood will work best in your home’s bedrooms. There are several members of the pine family, including the light-colored Parana and Lodgepole Pines, and milky white Eastern White Pine. All the varieties of pine are moderately strong and lightweight, but some are hardier than others. For this reason, Eastern White Pine and Parana Pine are the most common types of pine wood used to build furniture. Pine wood is most recognized for its straight and uniform grain with the occasional brown knot. It can also be porous, so it does require sealing with a water-based or oil-based polyurethane in order to prevent the wood from absorbing any moisture. As pine ages, it develops a nice patina, so the furniture you start off with will ultimately look slightly different the longer you own it. As far as cons go, because pine is a softwood, it can also be prone to dents, scratches, and nicks. Cedar is best known for its rich aroma and for its ability to resist shrinking, swelling, rot, and insects. For these reasons, it is a common wood used to make outdoor furniture, decks, and fences. But it is equally at home inside your house in places like the bedroom. The most common type of cedar used to make furniture is called clear cedar. This type of wood has a natural reddish-brown color that’s peppered with dark-toned knots. It also has the classic cedar aroma and can withstand fluctuations in temperatures and humidity. Aromatic cedar is what is most often used to line drawers, closets, and cedar chests. This is ideal because of all the cedars, this one has the strongest scent, which helps repel moths and other pests. Because it can withstand high-moisture environments, aromatic cedar is what is commonly used in spas and saunas, too. Log Furniture Place makes rustic bedroom furniture from a wide range of woods, including both pine and cedar. If you are looking for an heirloom-quality piece or you want something custom-made, we can help you out. We are confident you’ll discover we offer some of the best prices for custom-made pine and cedar wood bedroom furniture and accessories, from bedframes to nightstands and dressers. Our quality, service, and prices are why we're the top rustic wood furniture store online. Shop our entire inventory online or contact us today to learn about our customization options. We work tirelessly to ensure your complete satisfaction, and we back up that commitment with a solid warranty. This entry was posted in Log Furniture, Rustic Furniture, Cabin Furniture, Lodge Furniture, Bedrooms on January 5, 2019 by Log Furniture. When it comes to furniture, every home office generally revolves around the desk. It is the most popular piece of furniture in the room because that is where everything happens. Because of this, a home office desk needs to be sturdy, spacious, and comfortable to use. It is no surprise that wooden desks are the most in-demand furniture items among those who work from home every single day. Here are a few examples of the wooden desks we make at Woodland Creek's Log Furniture Place. Find the one that best suits your needs and your office, so you can create the ultimate workspace in your home today. Our country’s forefathers wrote our first pieces of law and legislature at modest, simple wooden writing desks. All they needed was a spacious and sturdy desk to conduct their business. The simplicity of these types of desks is what makes them so preferred even in today’s day and age. A basic wood desk just seems to work, and it keeps potential distractions to a minimum. Every student needs a good desk. From hand-writing essays to typing papers into a laptop, a comfortable desk with a solid surface is a must. A set of drawers is also required to store all of your budding student’s studying equipment, like pencils, paper, staples, and more. Computer desks are most often larger in size than student desks, and they also typically contain a second set of drawers to allow for even more storage capability. Also known as executive desks, these desks are what you will typically find in the office of a CEO, meaning they tend to be grand in size and scope. When you need a desk with additional storage, a wooden desk with a hutchtop is always an option. This desk features a hutchtop with additional drawers built-in and a flat top, allowing for even more storage. Natural wood comes in all shapes and sizes, and you can use this detail to custom-order a funky legged desk where the wood legs are actual logs, complete with bows and imperfections. Every funky legged desk is completely unique because no two logs are alike. At Woodland Creek's Log Furniture Place, we can make your custom desk from any wood you like. We offer Aspen, Reclaimed Barnwood, Cedar, Pine, and even more options. With us, you always get exactly the desk you envisioned for your home office. If you want your home office to have a gorgeous custom-made desk, then Woodland Creek's Log Furniture Place is where you want to get it from. We have a large selection of stock desks, and we can also custom-make desks to order. Check out our online inventory today and if you can’t find the desk you want, just let us know and we’ll make it for you. We work tirelessly to ensure your complete satisfaction, and we back up that commitment with a solid warranty. Contact us today if you have any questions regarding our process and/or customization options. This entry was posted in Log Furniture, Rustic Furniture, Cabin Furniture, Home Office on January 1, 2019 by Log Furniture. Purchasing new furniture is always difficult to do when you’re someone who is concerned about the environment. The thought of your old furniture wearing away in a landfill can be at odds with your intentions, and then there’s the environmental impact of your new furniture being manufactured. Thankfully, you have other options available to you. Furniture made from reclaimed wood not only looks and feels great, but it is also the most sustainable choice you can make when it’s time to buy new furniture, or to replace your existing furniture. Here are five reasons why you should always choose reclaimed wood, and why it is ultimately the best furniture material around if you’re someone who cares about the environment. Wood is one of the few things in life, along with wine, that only gets better with age. For starters, reclaimed wood has colors and textures that are simply unavailable from virgin wood. Whether from a barn or another resource, every piece of reclaimed wood has a story to tell, and as a result, it has a rich complexity that you just can’t get from any other product. Since the Industrial Revolution, manufacturing processes have propelled us towards a “use-and-toss” society. Today, most things are poorly made and not intended to last for more than a couple of years. The result is the product gets too-quickly thrown away and replaced by a newer one. While happens in every industry, from electronics to furniture, it has fostered a cycle of waste that is already at monumental proportions. By choosing to purchase reclaimed wood furniture for your home, you are breaking that cycle of waste. Instead of an old barn being destroyed and sent to the landfill, the wood is retained and used for other purposes. The manufacturing process not only produces a lot of waste, but it also produces a lot of carbon emissions, which are terrible for the planet’s atmosphere. On the other hand, there is no manufacturing process needed when you choose reclaimed wood for your funiture. The wood is simply cleaned up and used for a different purpose. We need our forests in order for us to be able to breathe while living on this planet. Every acre that is torn down for industrial reasons puts our planet at risk, and every year the situation gets worse. By choosing furniture that is made from recycled wood, you are doing your part to help protect our living forests from being decimated. Unlike contemporary furniture made from more modern materials, reclaimed wood furniture is often so durable it can last a lifetime, when handled with the proper care. The reason for this is because reclaimed wood is what is known as “old growth” wood. This type of wood is tightly packed, so it is more durable and stable than wood that is being forested today. Old growth forests have been nearly decimated by humans, so choosing reclaimed wood will help protect the few forested areas we have left from being removed from the planet forever. Woodland Creek's Log Furniture Place is the best place to chop for sustainably made reclaimed wood furniture and home décor online. We make it easy to find the perfect heirloom piece you’re looking for, no matter what you’ve got in mind. We work tirelessly to ensure your complete satisfaction, and we back up that commitment with a solid warranty, too. Shop our inventory online and we think you’ll quickly discover that we offer some of the best prices around for reclaimed wood products of all types. Our quality, service, and prices are why we're the top rustic wood furniture store online. Contact us today if you have any questions regarding our process and/or customization options – we’re happy to help! This entry was posted in Cabin Furniture, Lodge Furniture, Barnwood Furniture on December 28, 2018 by Log Furniture. Barnwood furniture is more popular now than ever, but have you ever thought about exactly what goes into transforming an old barn door into a stunning new dinner table for your dining room? Here, we look behind the scenes and share with you the process of using reclaimed barnwood to make a table. A barnwood table is built using aged barnwood that has been reclaimed during the tear-down process. When we are notified of a barn that is scheduled to be demolished, we send crews to the location to gather any wood that may be suitable for re-use. Barn doors are excellent sources of wood, as are rafters, floor joists, and framing. The collected wood is then loaded on a trailer and shipped directly to our workshop. Before the wood can be cut, it needs to be carefully de-nailed to ensure all the nails are removed. A metal detector is used to scan the wood to make sure no nails were missed. A custom table order will include the width and length of the table top that’s needed. Each piece of wood is cut to size and then glued together and held tight by pipe clamps until the glue is fully dried. The ends of the table are then mortised using a joiner. This ensures the finishing panels can be easily aligned for accurate placement. The legs or base gets attached next, and sanders are then used to clean up the wood in order to provide it with a smooth surface. Once the sanding is complete and the dust is removed, a coating of urethane is applied to the wood. Log Furniture Place custom makes all of our barn door tables by hand and from locally sourced reclaimed wood, so each one is completely unique. Shop our entire inventory of reclaimed wood tables online today or contact us today about placing a custom order. We work tirelessly to ensure your complete satisfaction, and we back up all our products with a solid warranty. Contact us today if you have any questions regarding our process and/or customization options. This entry was posted in Log Furniture, Rustic Furniture, Lodge Furniture, Barnwood Furniture, Dining Room on December 25, 2018 by Log Furniture. Custom Wooden Furniture Isn’t Only for Rustic Cabins! 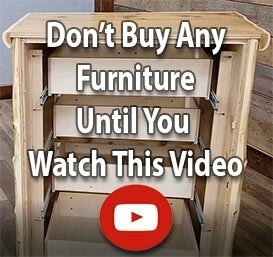 accommodate a custom piece of wood furniture, then you may want to think again. home’s dominant style may be. you too can enjoy the warmth and comfortable appeal of natural wood. normal in the entryway of any home, even when it isn’t holding any coats. Wood looks and feels right at home, no matter what your interior décor looks like. Log Furniture Place specializes in hand-crafting all-wood furniture, just like our forefathers once did. We only use locally sourced materials, including reclaimed wood from barns being torn down. have any questions regarding our process and/or customization options. This entry was posted in Log Furniture, Rustic Furniture, Cabin Furniture, Lodge Furniture, Cabin Decor on December 22, 2018 by Log Furniture. Wood is the best material for outdoor furniture because unlike plastic, it can last for many years if and when it is taken care of properly. This guide will help you learn the ins and outs of proper wooden patio furniture care, so you can enjoy your furniture next summer, and for many summers after that. First, Which Type of Wood Is Your Patio Furniture Made From? Outdoor furniture can be made from either hardwood or softwood. Hardwood is much more expensive than softwood, so softwood is the most common variety found in wooden outdoor furniture. Hardwood is only used in the most expensive luxury patio furniture. Because softwood can absorb moisture, it needs to be cleaned well before it is stored for winter and a fresh coat of finish or paint should be applied at the start of the season. Unlike softwood, furniture made from hardwood can withstand the harsh winter elements, so it doesn’t need to be taken inside. The best way to clean both hardwood and softwood outdoor furniture is to wash it using a clean cloth and warm, soapy water. You don’t want to use anything abrasive on softwood or it may scar the surface of the wood. A soft-bristled brush can be used on hardwood, however. Once you have completed the process of washing the furniture, you only need to dry it off with a clean towel – remember, do not let the water stand on the furniture. Sometimes over the summer months, wooden furniture can take a real beating from the sun and seasonal elements. If your furniture is made from hardwood and it is looking gray and weathered with cracks or deep grooves, then you will need to take a different approach to cleaning it. In this case, you should use a power washer to force the embedded dirt out of the grains. Make sure you test the power washer on a part of the furniture that isn’t seen, so you can ensure that it will do the job. You can add a touch of liquid dish detergent in the power washer’s water reservoir to help remove the dirt if necessary. Let the wet furniture sit overnight, so it can dry gradually. When the wood is dry, use lightweight sandpaper to sand down the surface. Next, rinse the wood dust away with a hose and let the wet furniture sit again overnight. Once dry, apply a coating of hardwood oil to restore the furniture to its former beauty. With your wooden patio furniture nice and clean, you will need to remove it and store it somewhere safe and dry over the winter, especially if it is made from softwood. When next spring rolls around, your furniture will be ready and waiting to see the sun again. Don’t forget to clean it again and apply a fresh coating of sealant. This way, it will stay protected all summer long. Whether you’re looking for a log glider, a rocking loveseat, or a rustic picnic table, you’ll find it at Log Furniture Place. We use only locally sourced materials in all our products, and we hire the very best woodworkers, so you can expect only the finest-made wooden outdoor furniture when you purchase from us. We think you’ll love the selection and prices of our natural wood products. After all, we work tirelessly to ensure your complete satisfaction, and we back up that commitment with a solid warranty. Contact us today if you have any questions regarding our process and/or customization options. This entry was posted in Log Furniture, Rustic Outdoor Furniture, Cabin Furniture, Lodge Furniture on December 19, 2018 by Log Furniture. Don’t Design a Custom Wooden Dining Room Table Without Reading This First! When you buy a wood table from Woodland Creek’s Log Furniture Place, you have the pleasure of knowing that your table is absolutely unique. This is because every table we make is composed of different pieces of wood, so the grain, color, and texture of the piece will be true to your table, and your table alone. This applies whether you purchase a stock table or order a custom-designed piece. But before you order, there are some things you will need to know if you are planning to have a table custom-made. Here are seven things you will need to know to ensure the table you get is the table you ultimately want and need. You can also choose to include a table leaf, which will allow you to expand the length of the table even more, accommodating more guests in the process. Rustic wood tables can be either formal or casual. You should know what style you want for your dining room because style can affect the type of wood or stain that is used to finish it. For instance, darker stains are typically better suited for formal tables, while lighter or more natural stains will tend to give the table a more casual feel. A formal table should also not be as distressed as a casual table. #3: Pedestal Base or Table Legs? Traditional wood tables often stand on four legs, but a thicker and more pronounced pedestal base is also an option. The larger your table, the thicker your legs or pedestals will need to be, and you may even need multiple pedestals. We use a variety of different wood to build each of our custom tables, so you will want to know what type of wood you prefer before you order. You can choose from Aspen, Cedar, Hickory, Black Walnut, Juniper, Pine, reclaimed barnwood, and more. Each has its own individual color, texture, and character. What shape do you want your table to be? Common choices include rectangle, oval, round, octagon, and square. Or, you can choose a rustic slab tabletop, which retains the interesting shape of the tree that the wood came from. The edge of the table is often overlooked, but it is one of your most important considerations because it can dramatically affect the overall look of the piece. The more common edge styles include round, square, and standard, but you can also choose a live edge, which is what you call it when the table features the natural beauty of the wood as its edge. With a new table, it’s highly likely that you will need new seating, as well. So, do you want a traditional set of wood chairs, benches, or a combination of them? A custom wood table will last for decades, and it may even become a treasured family heirloom that gets passed down through the generations. Because of this, you want to take the time to consider what you want and need in your table, so you get it right the first time. Log Furniture Place will work tirelessly to ensure your complete satisfaction, and we back up that commitment with a solid warranty, as well. Shop our inventory online today, and we think you’ll discover that we offer some of the best prices around for wood tables, chairs, and other rustic furniture and décor. Our quality, service, and prices are why we're the top rustic wood furniture store online. Contact us today if you have any questions regarding our customization options or process. This entry was posted in Log Furniture, Rustic Furniture, Lodge Furniture, Barnwood Furniture, Aspen Furniture, Dining Room on December 14, 2018 by Log Furniture. tips to achieve hygge in your rustic home this winter. and of course, the fireplace. any items that do not bring you intense feelings of joy. and/or to tell a story. so take inventory of your possessions and keep only what serves you around. you’ll have to do is to find additional ways to bring nature inside. loved ones add the sense of warmth and comfort that is key to the concept. the act of eating together. Log Furniture Place is a natural fit for those looking to achieve hygge in their households. All our products are made using locally sourced natural materials, which complement hygge philosophy perfectly. regarding our process and/or customization options. This entry was posted in Log Furniture, Rustic Furniture, Rustic Decor, Cabin Furniture, Lodge Furniture, Cabin Decor, Accessory Pieces on December 6, 2018 by Log Furniture. but isn’t it time you thought outside of the box? natural look of the wood making for a one-of-a-kind lamp. turquoise inlays can be inserted wherever the wood is naturally cracked. What is better than relaxing on a swing while gazing into the horizon? loved one will enjoy for years to come. can even add a gliding ottoman to match. Nothing makes a home feel warmer at the holidays than rustic wood furniture. At Log Furniture Place, we specialize in hand-crafting wooden furniture in the traditional ways of our forefathers. Every piece is unique and heirloom-quality. If you want to give someone special a gift that will last them a lifetime, then shop our selection of natural wood furniture and home décor online today. We work tirelessly to ensure your complete satisfaction, and we back up that commitment with a solid warranty. Contact us today if you have any questions regarding our process and/or customization options. This entry was posted in Log Furniture, Rustic Furniture, Rustic Decor, Cabin Decor on December 3, 2018 by Log Furniture.